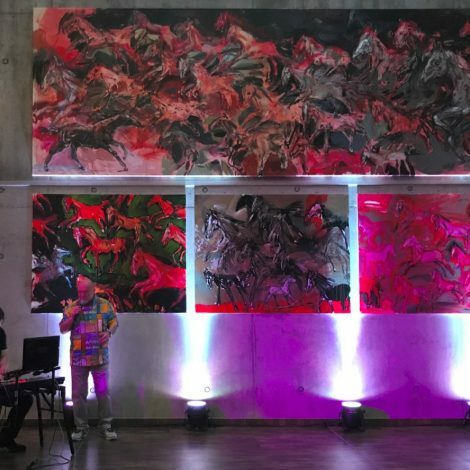 The exhibition entitled Horses on Concrete is actually a baptism of another piece of art in the rich collection of the Zoya Museum, which is somehow the conclusion of the collaboration between the painter Marek Ormandik and Zoya Gallery. Artistic piece called the “Large Herd” has an admirable dimension (200 x 560 cm) and is the largest painting ever painted by the artist. From May 19th, visitors can see it in the foyer of ELESKO Wine Park in Modra, where it hangs on cast concrete walls, along with three smaller variants from the author’s new collection. The opening of the exhibition took place on Friday, May 19, 2017 at ZOYA Museum. The show was musically accompanied by Peter Lipa. As a permanent exhibition, guests visiting ELESKO Wine Park in Modra will be able to see the works during their visit to ELESKO Restaurant without the necessity to book a specific date until the appeal.